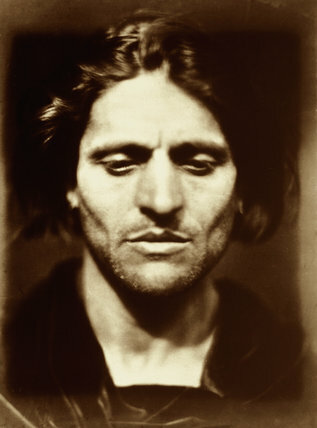 Photographic portrait of an Italian man, possibly an artist's model called Alessandro Colorossi, by Julia Margaret Cameron (1815-1879). Cameron's photographic portraits are considered among the finest in the early history of photography. She set up a private studio at her Isle of Wight home at the age of 48, after her daughter gave her a camera, and she became expert at using the collodion wet-plate process. This is the only photograph in which Cameron made use of a professional model.